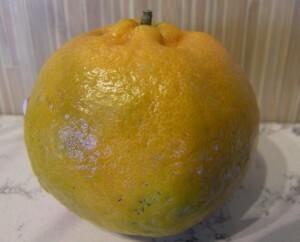 As a citrus lover living in a Midwestern state, I keep my eyes peeled to what’s going on to the west and south of me. Yesterday, I took a look at the California citrus crop for this year from the perspective of one farm. Tonight I am going to look at the Florida crop from the perspective of the Orange Shop, who ships more varieties of citrus than any grower/shipped in the country. They are located in Citra, Florida, which is just south of Gainesville. Here are some highlights of the information I received from them. 1. The Florida crop is earlier than last year. The fruit is sweeter and larger than last year. All positives in my book! 2. They started shipping Florida grown Clementines in the middle part of November. 3. After the Clementines comes the Page tangerines, which had a very good crop this year. 4. One of the most exciting parts of the Florida citrus season lately has been the release of the Honeybells. They are a cross between a grapefruit and a tangerine. They have a honey like taste inside of a bell shaped package. They are available for a short time in January. The Orange Shop is taking orders for those right now. Besides what I mentioned here, I have seen some Florida grown navals and blood oranges appearing in my local grocery stores from other sources. Looks like all the news is good from Florida so far this year. But there is always a danger of a frost causing damage to their crops. I decided to include a video below of what some farmers do to help save their crops when a frost is coming.